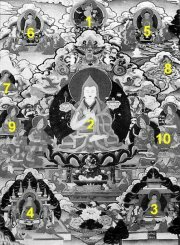 Yes, you can download and print high-resolution images of the Enlightened Beings, Buddhas and High Lamas absolutely free. Why are we doing this? We realise that it can sometimes be difficult to find good quality, iconographically correct images of the various Buddhas and Bodhisattvas, especially in places where Dharma is not strong, or in remote areas. Therefore, we are very happy to be able to make this selection of images available to everyone to download at absolutely no charge. The images are high-resolution and of sufficient quality to be printed clearly on an A4 or A3 sheet of paper and framed for your altar or shrine. ** Note that the high resolution files are large (up to 3Mb each) and will take some time to download. 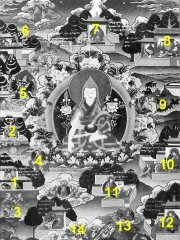 This series of 15 thangkas depicts the life story of Lama Tsongkhapa, 15th century saint and scholar of Tibet. Typically hung in the grand hall of monasteries, they illustrate how, throughout his previous lives, the Noble Je Tsongkhapa cultivated the Path leading to Enlightenment and how his spiritual progression was attested by prophecies of all the Buddhas of the past. Click on each image to view and download a high-resolution version that is suitable for your altar. 1 . Manjusri, the embodiment of the wisdom of all the Buddhas. His attributes are a book placed on a lotus flower above his left shoulder and the sword of wisdom which cuts the veil of ignorance above his right shoulder. Je Tsongkhapa is venerated as an emanation of Manjusri. 2. 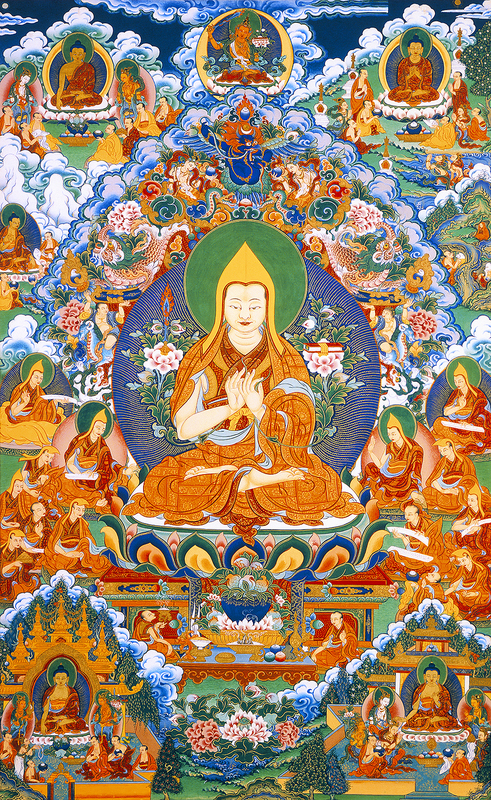 Je Tsongkhapa. His hands are in the gesture (mudra) of teaching the Dharma. 3. 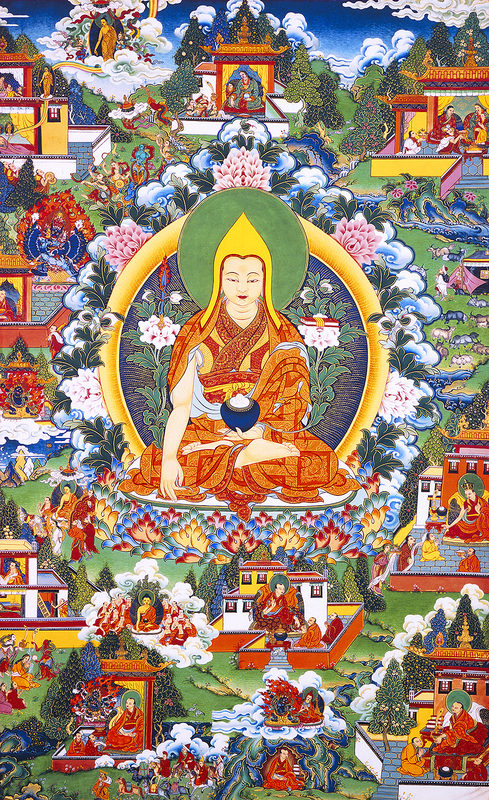 In a previous life, Je Tsongkhapa receives a prophecy from the Buddha Peak-of-Power (Indraketudhvaja). 4. When he takes rebirth as a young brahman, Je Tsongkhapa offers a rosary (mala) made of crystal to the Buddha Sakyamuni. 5. The Buddha Sakyamuni teaches on the shore of the lake Anavatapta and the King of the nagas offers him a conch shell. 6. On the Mount Kailas, the Buddha preaches the Law to celestial beings and nagas. 7. On the Vulture peak(Gridhrakuta), the Buddha Sakyamuni prophesizes the apparition of Je Tsongkhapa in Tibet. 8. The conch is hidden on one of the mountains of Tibet. 9. and 10. Great disciples of Je Tsongkhapa. 1. The father of Je Tsongkhapa dreams a monk comes to dwell in their private temple on the upper floor. 2. In his dream, the father sees Vajrapani throwing a vajra that melts in his wife’s body. 3. The mother of Je Tsongkhapa dreams celestial beings are purifying her. 4. Neighbors dream that the Jowo of Lhasa is being invited to their village. 5. The Master Dondrup Rinchen has a vision of Vajrabhairava announcing the apparition of Je Tsongkhapa. 6. The mother sees in her dream a huge statue melting in her body. 7. The night before giving birth, the mother of Je Tsongkhapa dreams she is purified. 8. The Master Dondrup Rinchen sends protection pills for the newborn baby. 9. The Master Dondrup Rinchen offers cattle to the parents and requests that the child be entrusted to him. 10. At three years of age, the young child receives his lay vows from the Fourth Karmapa Rolpay Dorje. 11. At the feet of Dondrup Rinchen, Je Tsongkhapa takes the vows of novice. 12. The Master Dondrup Rinchen bestows empowerments to the child. 13. 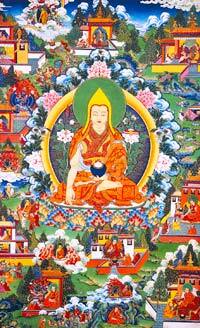 Je Tsongkhapa has a vision of Vajrapani and of the Indian Master Atisa. 14. Departure for Central Tibet. In Tcham-do, Je Tsongkhapa has a vision of the Sixteen Arhats and of Mahakala.